Two passengers have died in a charter bus crash northeast of Montreal that injured 26 others. Two passengers were killed Saturday morning when a charter bus skidded off the road and flipped on its side northeast of Montreal. The bus, with 52 people aboard including the driver, veered off the road about 8 a.m. Saturday and flipped on its side on Highway 165 between Plessisville and Saint- Ferdinand about 200 kilometres from Montreal. Sgt. Claude Denis of the Sûreté du Québec said 48 people were taken to hospitals in Victoriaville and Thetford Mines. Police say 52 people were aboard the bus, including the driver. 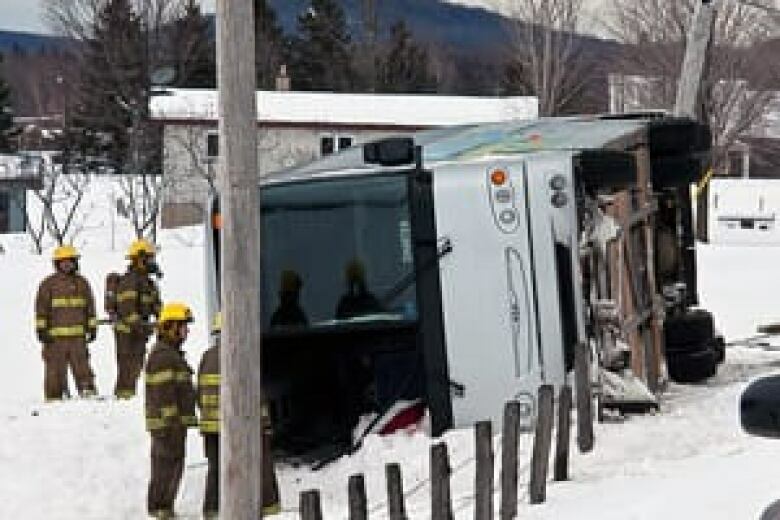 (Courtesy of Éric Desrochers)The Quebec provincial police officer said it's too early to say what caused the crash, but no other vehicles were involved. It was windy at the time, Denis added. Inspectors from Quebec's Automobile Insurance Board were also called to the scene to investigate. Police identified the passengers killed as a 67-year-old man from Stratford, Que. and a woman who was "around 70 years old" from Thetford Mines. Officials at the Hôtel-Dieu D'Arthabaska hospital, where 28 of the injured were taken, said the majority of the patients were seniors who had suffered fractures and other internal injuries. The injured were still being evaluated, and some may be moved to intensive care, Dr. André Nadeau told a news conference Saturday afternoon. "We're talking about older people," he said. "Any older person who suffers this type of [high velocity] trauma, it is significant." He said all of the patients were considered to be in stable condition. 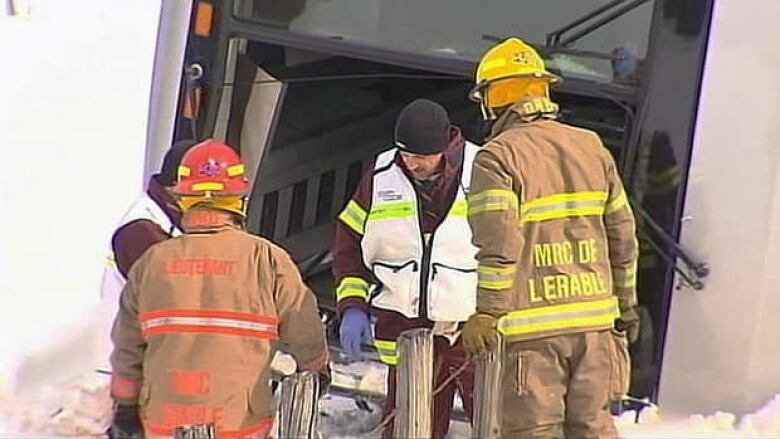 One passenger was transferred to a hospital in Quebec City, but her injuries aren't considered life-threatening. A crisis team was brought in to assist family members of the injured at the hospital. The bus left from Saint-Georges-de-Beauce Saturday morning and was headed to a casino in the United States. The vehicle is owned by Autocars La Chaudière, based in the Beauce region of the province. Pierre Breton, president of the company, said the bus was in good condition and had been recently inspected. The 57-year-old driver, who started working for the company five years ago after retiring from the military, was very experienced, he said. "All my sympathy is with the families who were affected by this unfortunate accident," Breton said, adding it was the first fatal accident in the company's 20-year history.